Guidelines for the private Student area of the forum are below. 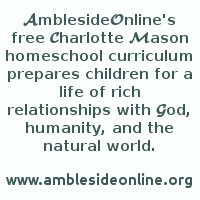 This is a support group for parents (and teachers) planning to use AmblesideOnline's Charlotte Mason curriculum. Discussion will focus on implementing this curriculum. We are all moms or dads, from a huge variety of backgrounds and philosophies, trying to give our young children a rich and full life. Thank you for participating with us in this! 1. This forum is intended to discuss implementation of AmblesideOnline's curriculum and application of Charlotte Mason's principles. Start threads in the proper forum. The difference between what is on topic and what is off topic in a specific forum area may sometimes be a fine line, so when in doubt contact a moderator directly. Participation on the AO forum is a privilege. Forum administrators reserve the right to moderate or ban (in extreme cases) members who do not conduct themselves according to the guidelines laid out here. Welcome Center, which includes Announcements, Meet and Greet, and Tech Support (teens have access to the tech forum, but no other forums outside the Teen area). AO Curriculum Help for questions about implementing AO, with resources and areas to discuss different age groups, family dynamics, and international locations. CM Study Hall to learn more about Charlotte Mason's methods in different subject areas. Private Groups, including a Teen Forum - There are instructions on how to join these groups in the Tech Support area. Amble Ramble - This is where you can "ramble" about anything you want to discuss, not necessarily related to AO and CM. Using the Tapatalk program to access the forum. No trolling, spamming, or flaming. SPAM and commercial postings will be deleted. Making personal communication public is prohibited. Do not post personal addresses or phone numbers. Limit your signature to three lines of text (including spaces between lines); nothing in your avatar or your signature can move or make noise. 3. Please treat others with respect and courtesy. Posts may sometimes come across with a harsher tone than intended, so show grace to others by assuming the best. Avoid harsh or judgmental language, and of course please use no profanity or unkind names (even if *** or other symbols are used in place of part of the word). Be careful that your own posts display a tone and content that reflects kindness and care for others. 4. Please avoid attempts to persuade others of the correctness of your particular parenting styles or other philosophical issues that don't directly relate to Charlotte Mason or AmblesideOnline. Whether you do or do not spank, whether you attachment parent or use some other method, read fairy tales or avoid them, believe in a young earth or an old earth, etc. you are welcome on this list. However, this is not the place to attempt to convert others to your views on those and other issues unrelated to CM and AO. (For some philosophical issues, there is a CM connection. These can be discussed here, but the discussion needs to tie directly to what CM had to say about these issues rather than our own personal preferences. Personal preferences may occasionally be appropriate to mention, in giving context to a book review, for instance, but on this list we are focused on understanding CM's recommendations and how to apply them using the AO curriculum, not on converting and persuading others to our own understanding and preferences in other areas). 5. Discussions of CM philosophy, methods and personal application are welcome, but this is the AO Forum, and thus, where AO provides a specific curriculum outline, discussions should revolve around AO and NOT other curricula, CM or not, commercial or otherwise. Discussions of other curricula should take place on boards hosted and paid for by the owners of those curricula. Where AO offers options simply as examples, allowed discussion will be broader yet always within the context of CM. 6. Do not use the forum for selling or advertising. Links to websites that pay you for directing people to their site are considered advertising. A simple link to your web site in your signature is okay. The forum includes a subforum for buying/selling AO/CM books which is viewable to all members, but only members who have 15 posts may post there; buying and selling is limited to that subforum, and limited to AO CM-friendly resources. Violating our restriction on using our forum for advertising constitutes an infraction that merits being moderated indefinitely, and banned if it persists. 7. When you can, using the Advisory affiliate links for amazon.com book links is courteous and preferred, because income from those links is how we pay for the forum. 8. The forum has lots of different areas. Choose the most appropriate one for your post, but don't post the same content in more than one area. If the moderators notice cross-posting, they will eliminate all but one thread to keep the forum clear of clutter. 9. Please don't post copyrighted materials to the board without permission from the copyright holders. That would usually be the original authors. Do not repost comments from other message boards, contents of posts in mailing lists, personal comments from Facebook statuses. Exceptions: You may post brief excerpts from published materials (300 words or less is fair use). You may post links to public blogs along with a sentence or two, or your description, in order to give forum members context so they know why they want to click on that link. Please don't link to sources for illegally obtaining copyrighted materials for free. Please do not post chain emails. Ever. If you do post a message from an email because it contains must read information for CM parents, please fix the formatting before posting to avoid making readers sift through a jumble of html code and messy carets. 10. The posts to this forum should stay on this forum unless the author of the particular post puts his or her own content somewhere else or gives written permission for that content to be shared. 11. This forum has a Christian focus, since Charlotte Mason was Christian and wrote from an explicitly Christian perspective. However, people of all religious backgrounds are welcome. Whatever your background, please remember that there are others on the list who don't share it, so show grace and love in your posts and avoid bringing religious differences into the conversation. Our purpose is to discuss the education and training of our children (focusing on Charlotte Mason and AmblesideOnline) rather than specifics of doctrine--even Christians disagree on many issues. 12. Remember that the moderators, Auxiliary, and Advisory are people, too! They work hard to help you, with no compensation, and do their best to keep the list running smoothly. Often they make difficult judgment calls with which you may disagree, but please be gracious and give them the benefit of the doubt. If you have a disagreement that needs further discussion, please contact the moderators directly rather than airing the issue on the list. If you air a disagreement with the moderators, Auxiliary, or Advisory publicly, here or on any public site, you will immediately be placed on moderated status. If it happens a second time, you will be banned. Also, we regret that the Advisory does not have the time to respond to PMs or private emails asking for personal education consultations, and they haven't the expertise to answer tech support questions. We can't cover every contingency, and we do not wish to try. Please recognize that your membership and participation in this forum are privileges and are permitted at Advisory discretion. The Advisory reserves the right to ban or moderate anybody for breaches of good taste, consideration or respect for others, or privacy. We reserve the right to be the final arbiters for what constitutes such a breach in our forum. We look forward to meeting you and learning with you! Administrators: Leslie Laurio, Kathy Livingston, and Phyllis Hunsucker. Advisory: Original creators of the AO curriculum, who oversee everything (albeit sometimes from a distance!) and make all final decisions about curriculum, direction and policy for AO. Advisory members are: Anne White, Leslie Laurio, Karen Glass, Donna-Jean Breckenridge, Lynn Bruce, and Wendi Capehart. Auxiliary: Assist the Advisory by working on curriculum-related projects (such as folk songs) outside the forum and by being well-informed enough to answer questions in the forum about the curriculum. Auxiliary members are: Phyllis Hunsucker, Kathy Livingston, Lani Siciliano, Amy Tuttle, Naomi Goegan, Brandy Vencel and Advisory progeny Caitlin [Bruce] Beauchamp, Rebecca Capehart and Tim Laurio. Moderators: Oversee specific areas of the forum. They can be identified by the tag under their name, as can the Advisory and Auxiliary. The AO Teen Subforum is a private support group for AO students at least 13 years of age whose parent is a member of the Forum. We have done our best to provide a safe place for students to chat and get to know each other. Private messages (PM's) are turned off for student accounts for their personal safety. Although we have set safety precautions in place for our teen subforum, we have no control over communication that happens outside the forum. Parents, we strongly urge you to know what your students are doing online, and to be aware and watchful of communication that our students may take off the forum. Participation on the AO forum is a privilege. Forum administrators reserve the right to moderate or, in extreme cases, to ban students who do not conduct themselves according to the guidelines laid out here. SPAM and sales posts will be deleted. For your own safety, do not post personal addresses or phone numbers. Your signature has a three-line limit; nothing in your avatar or your signature can move or make noise. 3. Please treat others with respect, courtesy, and kindness. Avoid harsh or judgmental language, and unkind name-calling. Make sure that your own posts display a tone and content that reflects kindness and care for others. 4. Profanity is not allowed, even if *** or other symbols are used in place of part of the word. 5. Whatever your religious or political background, please show grace and love in your posts and avoid bringing religious or political differences into the conversation. Although the AO curriculum has a Christian focus, we do not require that our members be Christians, but we do require that respect be shown for Christian beliefs. Please avoid attempts to persuade others of the correctness of your particular religious or political opinions. 6. Please don't post copyrighted materials to the forum without permission from the copyright holder. A link to content is fine; copying and posting content from elsewhere is not. Do not repost comments from other message boards, contents of posts in mailing lists, personal comments from Facebook statuses. Posts to this forum should stay on this forum unless the author gives written permission for that content to be shared. 7. Please don't link to sources for illegally obtaining copyrighted materials.